Ruby 2.4 got released this Christmas with a lot of exciting features. One of the most underrated features in ruby 2.4 is hash table improvements. Before going into details about implementation, let’s first check the benchmark to know how this change gonna affect your ruby application. If you are a ruby developer and excited to know what are the new features in ruby 2.4, then this feature gonna make your application faster and you don’t have to change anything in the code for that. Because these changes are backward compatible. If you are curious to know what happened behind the scenes of this performance boost, then continue reading. In other words, it is a data structure that allows you to store key value pair and helps to fetch specific data using the key in an efficient way. Unlike arrays, you don’t have to iterate through all elements to find a given element in the hash. If you are new to this data structure, check this cs50 video for a better understanding. That is cool right! Now, let’s see how this is made possible in ruby. Ruby internally uses a structure called st_table to represent hash. 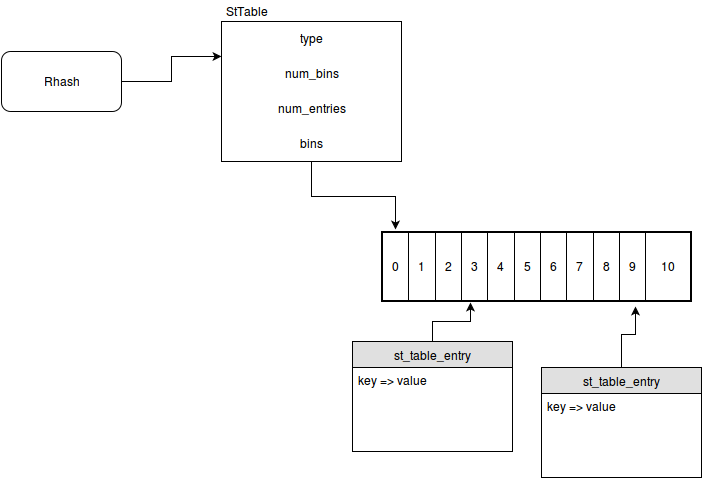 st_table contains type, the number of bins, the number of entries and pointers to bin array. Bin array is an array with 11 default size and can grow when required. Let’s take an example of hash and see how it will be represented using above diagram. First thing ruby does is it will take the hash of the key using the internal hash function. What if there are multiple modulo operations that give the result? This is called hash collision. To resolve this, ruby uses a separate chaining approach i.e, it will make a doubly linked list and add it to the existing value in the bin. What if the hash is too large ?? Linked list will start growing and will make the hash slower. So, ruby will allocate more bins and do an operation called Rehashing to utilise newly added bins. In ruby 2.0, Ruby eliminated the need for extra data structures for smaller hashes and uses linear search for better performance. In 2.2.0, Ruby has used bin array sizes that correspond to powers of two (16, 32, 64, 128, …). In ruby 2.4, Hash table is moved to open addressing model i.e, we no longer have the separate doubly linked list for collision resolution. Here, we will be storing records in the entries array itself i.e, there is no need of pointer chasing and data will be stored in the adjacent memory location (Data locality). The hash table has two arrays called bins and entries. Entry array contains hash entries in the order of insertion and the bin array provides access to entry the by their keys. The key hash is mapped to a bin containing the index of the corresponding entry in the entry array. Ruby will insert an entry to entries array in sequential order. If the item to be deleted is first one, then ruby will change the index of ‘current first entry ‘, otherwise ruby will mark the item as reserved using a reserved hash value. In the ruby source code, DELETED is marked using 0 and EMPTY is marked using 1. ** Small hashes will use the linear search to find entries from ruby 2.0 onwards to avoid extra overhead and improve performance. Given example is just for reference only.